I married when I was 27. Great guy. I thought life was everything I wanted it to be. Two years in, my dad died suddenly and a series of subsequent catastrophic choices found me living with a man for whom I’d abandoned my husband/marriage. Life was surely easier, the grass most certainly greener, 'over here.' We moved across the country (me, running; him, getting "a fresh start out west") and set up a new life. Our life. The life that would carry me through to the end of my days…or so I thought. Eight months after arriving at our new life, this man came home one day and announced – quite unceremoniously – that he didn’t think he loved me anymore. His words and departure set into motion a vortex that spun violently for the next four months, daily pulling me deeper into unimaginable sadness and despair. Alone and beyond heartbroken, I fell to my knees one night at my bedside. Surrendering out of absolute emotional and physical agony, I cried out to God, saying, "I’ve made a mess of my life! I can't fix this – only You can. You've got to take over running me – I can’t do it anymore. And if You don't, I can’t go on." I fell into bed sobbing, aching and hollow in my very core. The next morning, inexplicably at the time, I woke with the most incredible, tangible peace I have ever known! I felt like a new person, like daybreak had finally come to my long, dark night. Over the ensuing weeks, I had such a yearning for spiritual things. I was compelled beyond comfort to find a church; I longed for the company of kind, welcoming, Christian people. I visited a church one Sunday morning and – gee, imagine! – the pastor said things like he was talking just to me! How could he know? How could this be so perfect? Although I believe I was saved that night at my bedside, I prayed the salvation prayer that Sunday morning, asking Christ onto the throne of my heart. That church and those people – the body of Christ that welcomed me in and enveloped me in His love – have been my home and family for the last 13 years. If you were blessed to find, accept and proclaim Jesus at a young age, and have remained walking with Him through your life, how I envy you! But at the same time, I don't discount the path to salvation that my own life took. Not everyone’s trip is picturesque, and for those of us who suffered to it, everybody's rock bottom is different. But it's the way it should be; the architect of the universe designed it exclusively for me, for you! Like Paul, I consider myself chief among sinners. But in the words of a most beautiful song, I cannot fall or climb farther than [His] grace can reach. No one can. I hope you've enjoyed reading Meri's story! I am certain that she would love to hear your thoughts in the comments section. And if you would like to share your own salvation story as a guest post, please let me know! Welcome Sister. The Lord led you to him and I am go glad he did. Heartbreaking but wonderful story. Blessings upon you. 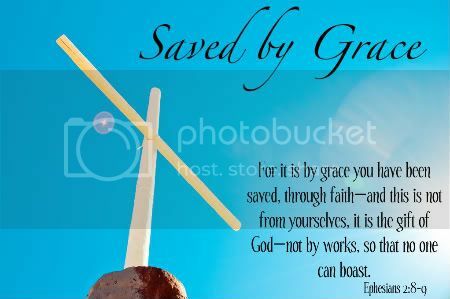 I am so glad that God's grace rescued you. It's a wonderful thing to be loved and known by God. Thank you for sharing your story! A-men, I can't imagine the relief you felt the next morning. I am glad you shared your story, I'm sure it will be inspiring for some and then others who just need the extra word. I guess it doesn't matter when or what takes to on this road as long as the end result brings you to his glory. God is so gracious and ever loving. Always waiting for us to come home. I only wish we (I) didn't have to hit so slow to see my way clear to the one who had His hand outstretched ready to forgive me. Been there done that. There really is nothing that can describe that overwhelming peace that comes when one finally finds the answer in Him! Great story and testimony. Thanks for sharing it with us.